There comes a time in one’s life when circumstances require you to take a cold, hard look at your stuff. Moving to a smaller living space and downsizing force you to make some hard choices. 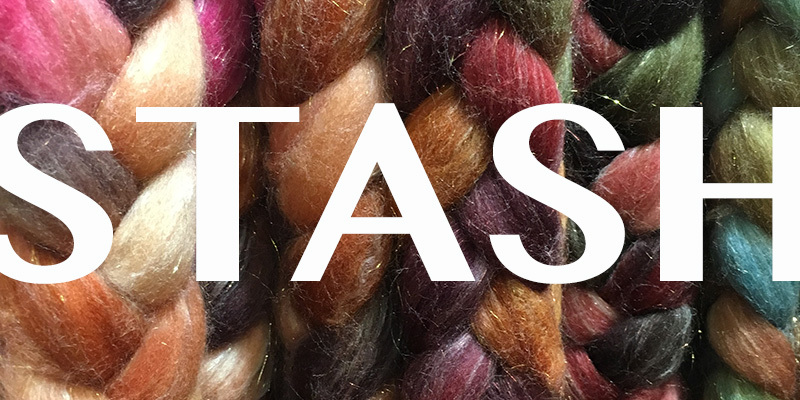 It’s a process, and letting go of some of your prized fiber stash (gulp) can be emotional for a fiber lover. We’ve all seen images of beautifully spare rooms, which look like no handspinner has ever left hair balls of spinning fiber on the pristine white rug. Cleanliness aside, moving offers the opportunity to unload some items that take up space but are rarely, if ever, used. Twenty years ago, I baked cheesecakes for friends and family, but haven’t touched my springform pans since. This old hobby no longer needs to take up space in my life; I can easily let the pans go. Fiber and yarn stash is trickier; my life revolves around needlecrafts. In The Life-Changing Magic of Tidying Up, Marie Kondo asks readers to question, “Does it spark joy?” Well, yes . . . it’s yarn . . . and fleece . . . and tools! The “KonMari” method of decluttering won’t help many fiber enthusiasts release their stash. But maybe I don’t need three spinning wheels. Move over hygge! Swedish death cleaning has become the hot new Scandinavian trend, but it’s not quite as morbid as the name sounds. The Swedish word döstädning is a mashup of the words dö, meaning “death,” and städning, meaning “cleaning.” Author of The Gentle Art of Swedish Death Cleaning Margareta Magnusson recognizes that preparing for our eventual exit is a gift to our surviving friends and family. She advocates discarding our unused belongings as we face our later years. Magnusson herself is over 80 and asks readers a different question than Kondo. 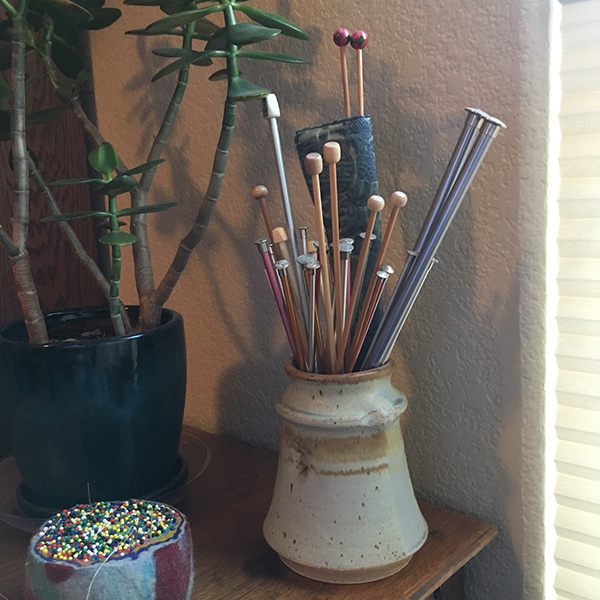 She has us ponder, “Will anyone be happier if I save this?” This question makes me remember what joy it brings me to see my grandmother’s brightly colored aluminum knitting needles in their vase each day. One way I’ve been able to scale back my stuff is by switching to digital versions of my favorite craft magazines, knitting patterns, and how-to videos and courses. Stuff stored in the cloud won’t require buff movers to relocate it. Have any stash-downsizing tips to share? Let me know in the comments! Featured Image: Keep the stash that “sparks joy.” Photo by Jenn Rein. Save room for your stash with these downloads from Spin Off! From many years of quilting, I picked up a tip from some fellow, senior, quilters. They would sort their stash into projects in labelled bins. The bins would also be labelled with the name of a dear friend and fellow quilter. When family members are left with the task of dispensing with the stash there were no questions as to the destination. After I accumulated multiple sets of needles in the same size or yarn I didn’t really like, I put together start-up kits for budding knitters and asked them not to return anything they didn’t want. I also threw in a few free knitting lessons to keep their motivation high. Plus a weaving guild I belonged to also held regular draws raffles for old stash from guild members – the proceeds were used for guild events, communal looms and the magazine lending library. “…maybe I don’t need three spinning wheels.” What blasphemy is this?!?! In all seriousness, I actually lost about 95% of my stash in a fire in 2010, and that experience taught me that 99% of that stash is usually replaceable. Most of us have no problem whatsoever acquiring more. That makes it easier for me to let it go. I live in a very tiny space with too many people in it already and I’ve been thinking that it’s time to do another destash myself. My plan this time is to bless as many other new spinners as I can by offering up small amounts for shipping charges only, or something of the sort. Not sure when I’ll get to it, but I keep thinking of one online friend in particular who blessed me with a package of fiber out of the blue just a month or two after that fire. She was destashing and knew I had lost mine. I think I’ll pay it forward, somehow.